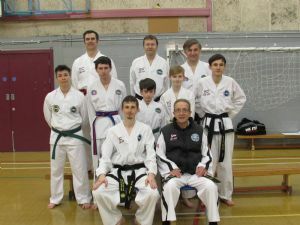 On Sunday 19th April 2015 Master Wood VIII Dan visited Leicester Taekwon-Do to conduct a seminar. This is the second year in a row that Master Wood has visited and was just as enjoyable as before. The seminar started at 11am with Master Wood VIII Dan going through some basic techniques. The purpose here was to emphasise the sine wave within Taekwon-Do. Sine wave was explained in detail and then all students were given the chance to try these skills within a variety of different techniques. After a small talk about the application of power, we moved on to step sparring. All participants were guided through 3 and 2 step sparring and had the chance to ask questions and explore how the techniques work. The colour belt's seminar ended with Master Wood VIII Dan going through and demonstrating the kicking drills. After this there was a small break when a group photo was taken and the colour belts left. The senior colour belts and black belts stayed and Master Wood VIII Dan continued with his seminar and learning. The next part of the seminar started with Master Wood VIII Dan running through the self-defence drills. All drills were explained in detail and all students were given the time to perform and experience these techniques. After this Master Wood VIII Dan moved on to breaking within Taekwon-Do. The emphasis here was that there are lots of elements that are need to come together in order for breaking to be successful. Master Wood VIII Dan demonstrated how to correctly perform a punch and side fist strike. Master Wood then moved on to kicking, getting the other members of the club to demonstrate and to break. All members said that this was insightful as they all gained something from this that they could take and apply to their own breaking. The seminar ended with Master Wood speaking about how asking questions is important within Taekwon-Do. He stressed how students need to ask if they are unsure. Leicester Taekwon-Do would like to extend their gratitude the Master Wood VIII Dan for taking time out and for making the seminar so enjoyable.